The art of palm reading is called palmistry and has been practiced for centuries in Asia, Persia, Ancient Israel, and Babylonia. Palm reading was taken very seriously by many significant minds that have sculpted the course of our history like Alexander the Great and Aristotle, who once stated: “Lines are not written into the human hand without reason. They emanate from heavenly influences and man’s own individuality.” The line we are referring to today is called your heart line. 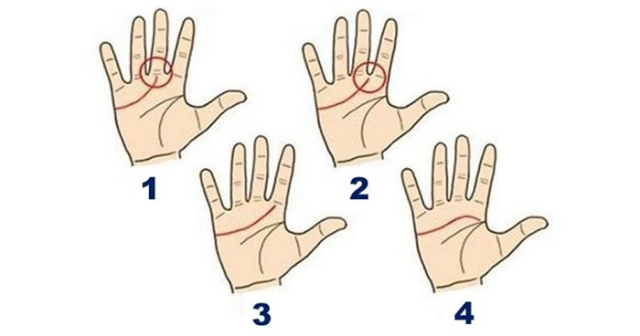 The heart line is the top-most line on your hand. 1) If this is your heart line, you’re ambitious, independent, intelligent, and have a lot of good qualities when it comes to judgement and making decisions. You may also have a selfish, materialistic outlook on life. Use your good qualities to better your community and yourself. 2) This is my heart line and is very accurate for me! If you have this heart line, you’re more considerate, kind, and trustworthy with people. You tend to give away your heart a little too freely. It may take work, but it’s important to know when to be guarded. 3) If this is your heart line, you tend to be content and confident in your love life, whether you’re single or in a relationship. You’re happy either way.